Radio Spirits » Blog Archive » Happy Birthday, June Foray! In 2009, Bear Manor Media published Did You Grow Up with Me, Too? : The Autobiography of June Foray. The titular performer—born June Lucille Forer in Springfield, Massachusetts on this date in 1917—collaborated on the book with cartoon historians Jerry Beck and Earl Kress. (At the risk of being facetious, we’re surprised that the tome – it’s 164 pages – isn’t the size of ten city phone books.) 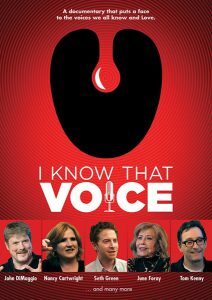 June was without question “The First Lady of Voice Artists” (not to be confused with “The First Lady of Radio”). 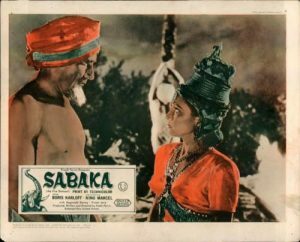 An incredibly talented performer, she was not only one of the founders of ASIFA-Hollywood (the society devoted to promoting animation) but was instrumental in the creation of that organization’s “Annie Awards.” June also played a major role in convincing the Motion Picture Academy of Arts and Sciences to begin handing out an Oscar for Best Animated Feature in 2001. 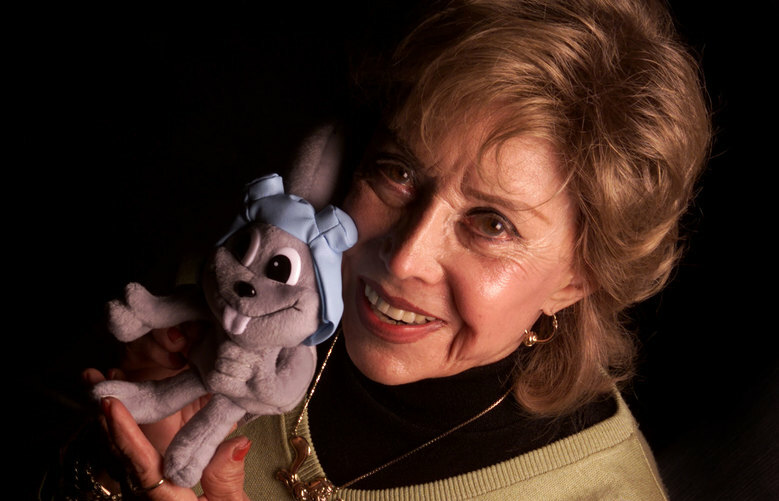 One of three children born to Ida and Morris Forer, June Foray’s ambition as a youngster was to be a dancer—but she was forced to quit classes after she developed a case of pneumonia. Undaunted, June set her sights on acting and performed on her first broadcast at the age of twelve. Three years later, she was working regularly, doing voices on the air at Boston’s WBZA. After graduating from high school, Foray moved with her family to Los Angeles to live with her mother’s brother (after father Morris had fallen on hard times). Settling in on the West Coast, June would soon star in her own series, Lady Make Believe—a program that she also scripted. 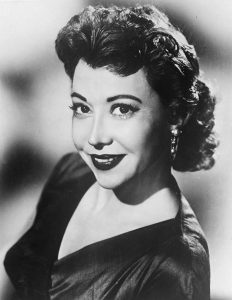 June Foray had hit the big time by the 1940s with many assignments on network radio. She was a regular on the popular children’s program, Smilin’ Ed McConnell’s Buster Brown Gang, playing Midnight the cat (“Nice, nice…”) and Old Grandie, the piano. (While working on the McConnell show, June met and married her second husband, director Hobart Donavan.) Foray also did multiple voices on Smile Time (Keep ‘Em Smiling), a Mutual variety show starring a young Steve Allen, and performed the same utility function on The Jimmy Durante Show. During her radio career, June worked with many of the legends: Edgar Bergen, Phil Harris & Alice Faye, Bob Sweeney & Hal March, and Rudy Vallee. In addition, June emoted on Amos ‘n’ Andy, Command Performance, The Life of Riley, and Our Miss Brooks. 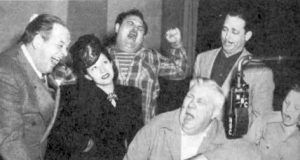 If you’ve ever listened to the July 13, 1949 audition for what later became Gunsmoke (“Mark Dillon Goes to Gouge Eye”), you’ll hear June Foray’s unmistakable voice as the treacherous woman who unsuccessfully tries to persuade our hero not to arrest her for murder. (Foray noted in her autobiography that she perfected her Spanish accent on the Steve Allen program, and it’s “where my booming Marjorie Main-type voice got a good workout.”) June did an impressive amount of dramatic radio; among her credits are appearances on The Adventures of Philip Marlowe, The Cavalcade of America, The CBS Radio Workshop, The Chase, Family Theatre, Favorite Story, Lassie, Let George Do It, The Lux Radio Theatre, The NBC University Theatre, Night Beat, The Railroad Hour, Rocky Fortune, Rocky Jordan, Screen Directors’ Playhouse, Suspense, and You Were There. Foray was also one of the many cast members in On a Note of Triumph, the legendary Norman Corwin (director, producer, and author) broadcast that commemorated V-E Day. 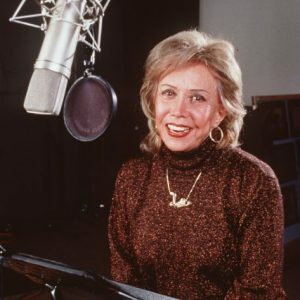 As radio started to cede its audience to that upstart television—and as the motion picture studios started to gather up the ink-and-paint supplies that made possible their animated cartoons—June Foray would eventually find a use on the small screen for her many voices. Not that she didn’t go out over the ether without a fight. In the summer of 1957, comedian Stan Freberg relied on June to do most of the female parts on The Stan Freberg Show. 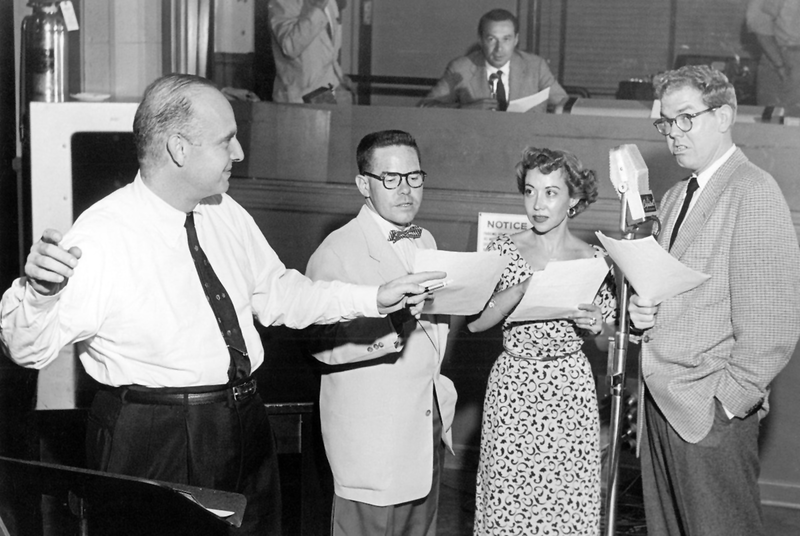 Stan and June knew each other well from their WB cartoon work, and June had previously performed on Freberg’s many comedy records, including 1953’s #1 smash St. George and the Dragonet. 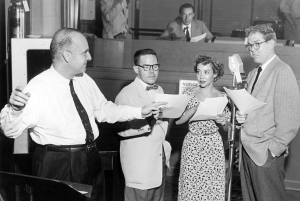 (“He breathed fire on me…he burned me already!”) The Stan Freberg Show was radio’s last gasp when it came to great comedy, and June was always sensational—my favorite role of hers on the show was the secretary in the “Grey Flannel Hat Full of Teenage Werewolves” sketch. 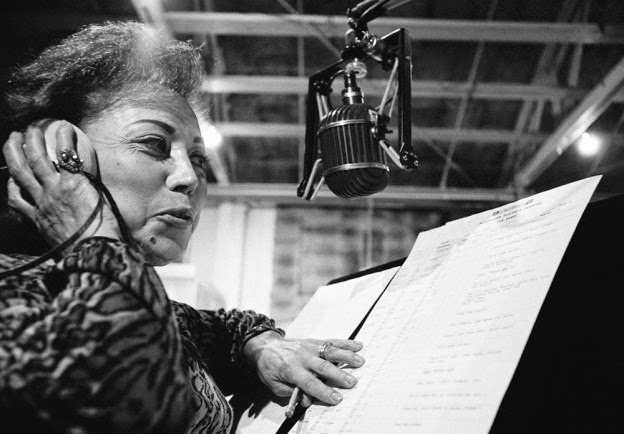 “June Foray is not the female Mel Blanc,” the legendary animation director Chuck Jones once observed. 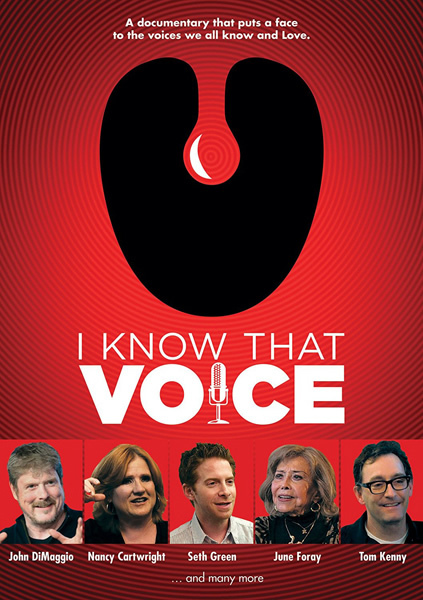 “Mel Blanc was the male June Foray.” Our birthday girl is one of several voice talents featured in the 2013 Annie Award-winning documentary I Know That Voice (available on DVD from Radio Spirits), and because Foray never abandoned her radio roots (appearing on both The Hollywood Radio Theatre and The Sears Radio Theatre in the 1970s) you can hear her in our CD collection of the radio revival series The Mutual Radio Theatre. Listen for June in our The Adventures of Philip Marlowe and Our Miss Brooks: Faculty Feuds sets, too! Happy birthday, June–I know this is going to be something we really like! « Happy Birthday, Lauren Bacall!